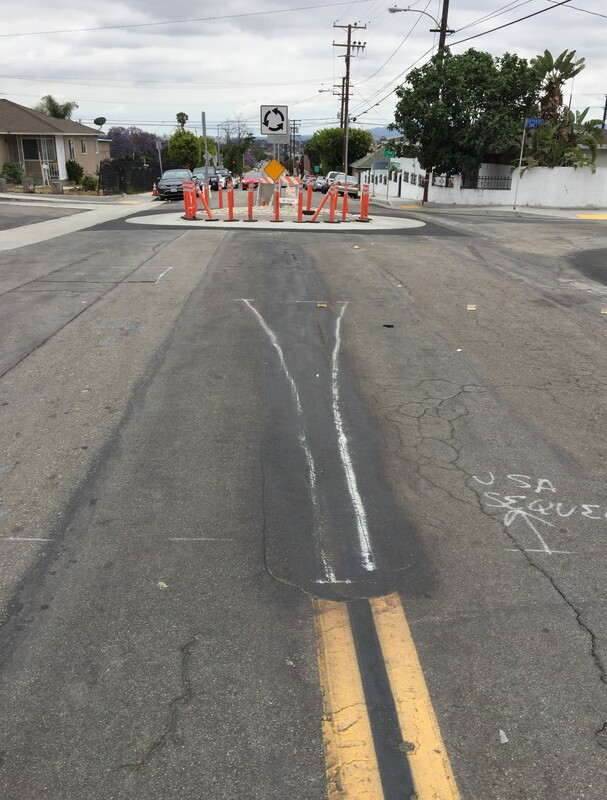 This traffic circle on Budlong Avenue at 127th Street is part of an L.A. County bicycle boulevard under construction. Photos by Joe Linton/Streetsblog L.A. 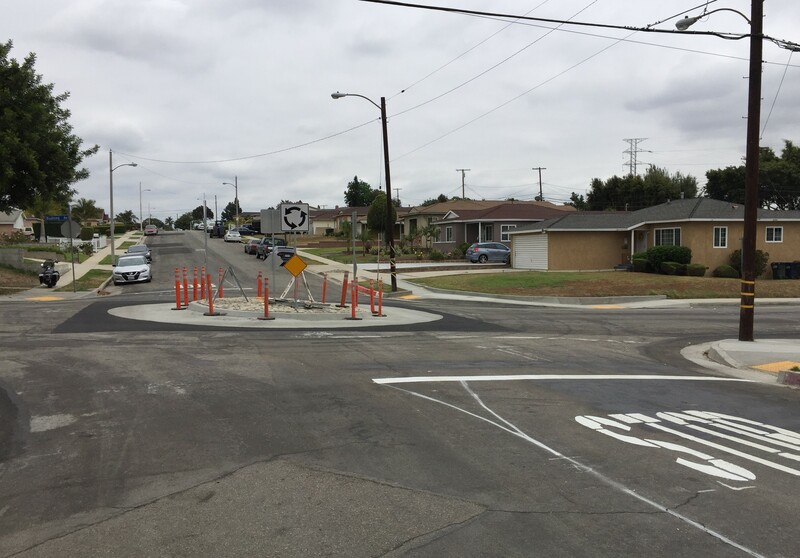 Earlier this week, Streetsblog came across a new bicycle boulevard facility under construction and nearly complete. 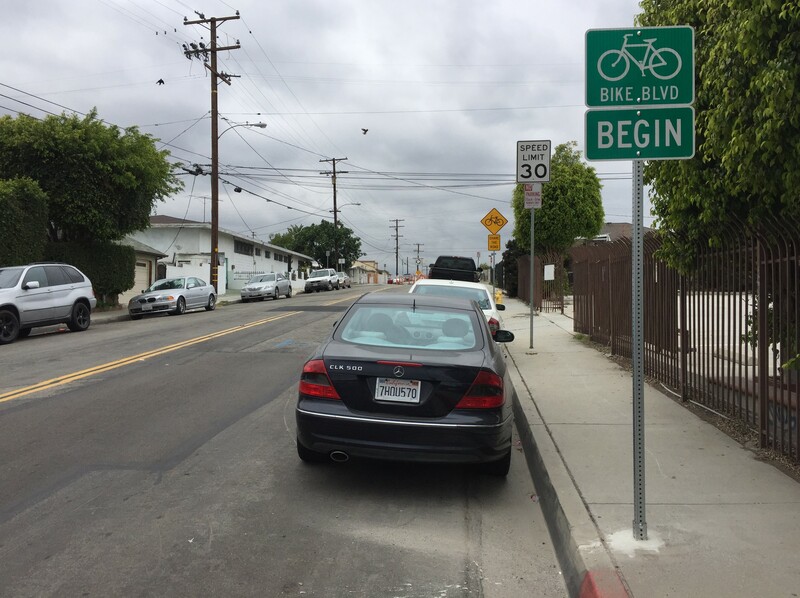 The bikeway is located on Budlong Avenue from El Segundo Boulevard to at least 120th Street, in the South L.A. neighborhood of West Athens, which is part of unincorporated L.A. County. The facility is immediately north of the city of Gardena, and a couple blocks from the Metro Green Line Vermont/Athens Station. Bicycle Boulevards (sometimes called Neighborhood Greenways or Bicycle-Friendly Streets) are low traffic volume streets, generally with traffic calmed so that cyclists, pedestrians, and drivers can safely share space. They have been implemented in Berkeley, Portland, Santa Monica, and many other cities. 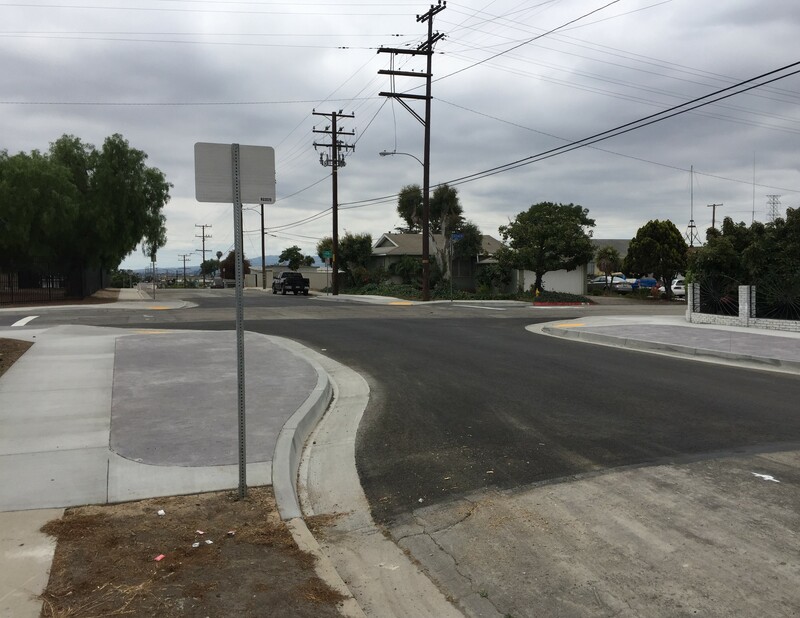 Though many southern California cities have these sorts of quieter through streets that are attractive for bicycling and walking, this type of facility has not caught on much locally. There is not a lot of detail online about the Budlong project, though one county document identifies it as a Safe Routes To School project to help folks walk and bike to get to 95th Street Elementary School, Woodcrest Elementary School, and West Athens Elementary School. Below are photos of the under-construction bicycle boulevard. 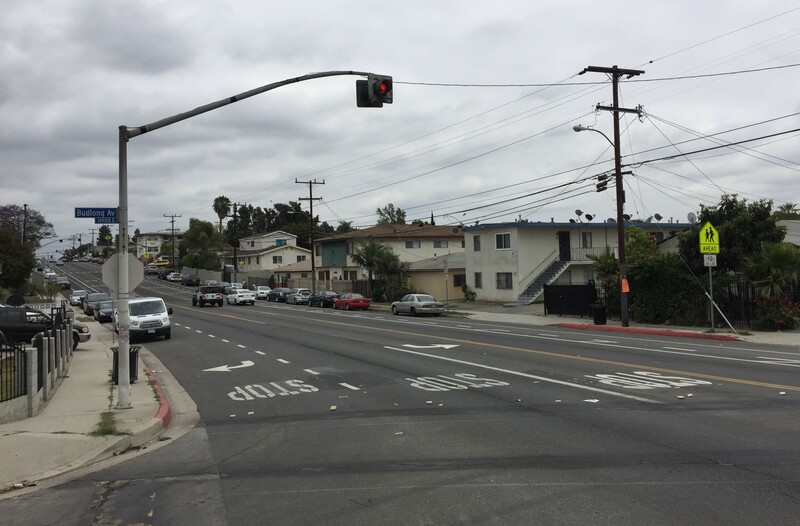 Some re-striping underway at Budlong and 120th Street where the intersection appears set to receive new crosswalks. Based on Google street view, for at least a few years, this has been a 4-way stop, with a flashing red light signal. 120th Street has buffered bike lanes, which were added as part of a road diet done at some point after June 2016. I will never understand having this many dedicated lanes at stop signs. Hayward’s got a crazy one at Chabot and Depot in the industrial area. Agreed. I’ve driven through intersections nearly as bad as this, and they become gridlock because of persistent driver hesitation and apprehension. 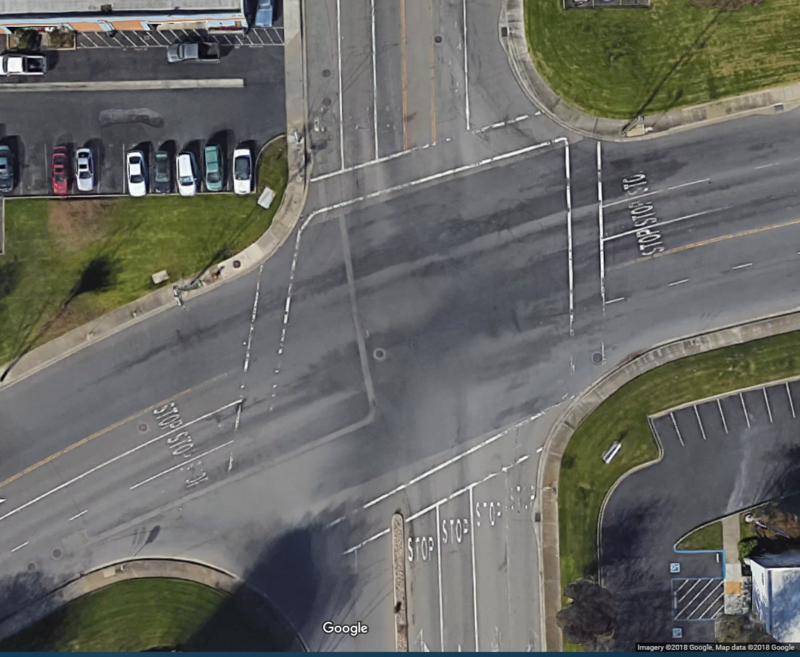 There’s simply too much information for a single driver to process at one time, and no one can remember exactly who got to the intersection first, or if two people from different sides of the intersection arrived simultaneously, while others arrived just two seconds later. That same apprehension keeps these from being the sites of numerous minor collisions, but it also only amplifies the gridlock. It would be great if they can get it continued farther all the way across the freeway. Getting past those barriers on a bike can be extremely daunting.